Today as the miracle of PI is known, I take the opportunity to reflect on the wonders of Autism. I read a book – Born on a Blue Day by Daniel Tammet – when it was first published. 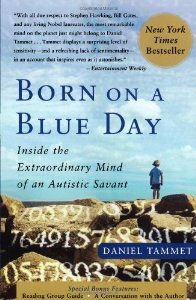 This a truly remarkable autobiographical account of one man’s journey in the world of an Autistic Savant. He does everything by the numbers. For example, he counts the number of items of clothing that he is wearing before he leaves his house. He eats a specific weight of cereal everyday. Never more, and never less. What is most remarkable is that he worked to memorise PI to 22,514 places. Unfortunately, he made a mistake in position 2965, and did not retain the world record. But still… Can you imagine remembering PI beyond 3.14 for any reason, other than because you could? In his book, Mr. Tammet describes how he sees numbers as colors. It is a truly fascinating read and illustrates one Autistic Savant’s ability to live in the world that everyone else sees one way, while his vision shows him other views. I won’t discuss Mr. Tammet’s sexuality, because it isn’t my business. He does talk about it in his book. I can’t imagine what it would be like to struggle with autism while also struggling with sexual identity. Mr Tammet seems to have come to terms with both very well. For more information about Daniet Tammet, and his various speaking engagements, check out his website: Optimnem: The Official Website of Daniel Tammet.